In the Japanese kitchen there is no food waste! In Europe and the rest of the world there is food waste. By that, I mean there are raw materials being thrown out and I am not talking about raw materials where the expiry date is over. The Japanese cuisine is quite unique. There is tradition for using every part of the animal in cooking. Take for example a fish. In the Japanese eyes, the head, finder, skins and legs can be used in food lavage. Yes, even the indents can be transformed into a delicate eating. It can of course sound a bit funny but the parts are transformed into delicious and tasteful eating. 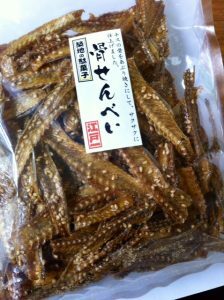 Below you will see the fish bone which has turned into a crisp and tasty snack.